Ole Gunnar Solskjaer: What can Man Utd expect from interim manager? There is no doubting Ole Gunnar Solskjaer’s place in Manchester United folklore – but the fact he is now their caretaker manager has raised a few eyebrows. 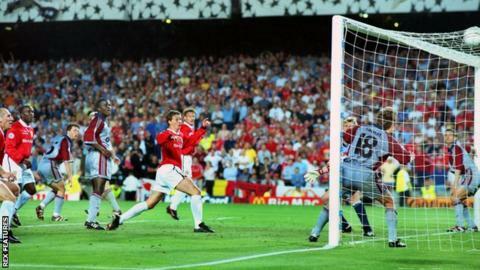 Solskjaer scored 126 goals in 366 appearances during his 11 years at Old Trafford and is best remembered for scoring the winner in the Champions League final against Bayern Munich in 1999. The fans’ favourite – affectionately known as the ‘baby-faced assassin’ – also won six Premier League titles and two FA Cups with United. But as a manager, he is somewhat unproven. Solskjaer has enjoyed two successful spells with Norwegian club Molde but, between those, he lasted less than nine months at Cardiff City and got them relegated from the Premier League. Arguably that failure is a blot on an otherwise burgeoning CV, but it is a significant enough one for some to doubt whether he would be the right man to succeed the sacked Jose Mourinho at Old Trafford. “For Manchester United to be appointing an interim manager is a shambles,” said former United midfielder Robbie Savage. “Yes, Solskjaer might have scored the winning goal in the Champions League final but is this where Manchester United are? One of Solskjaer’s former United team-mates, Darren Fletcher, is a little more open to the idea. “Ole has got cutting words,” he told BBC Radio 5 Live. Tor-Kristian Karlsen is the sporting director at Norwegian club IK Start and previously held the same role at clubs such as Monaco and Maccabi Haifa. Karlsen has followed Solskjaer's playing and managerial career and his IK Start side have faced Solskjaer's Molde on several occasions. "The way I see it, Solskjaer appears more ready to face a new challenge now than when he joined Cardiff," Karlsen told BBC Sport. "I'm sure that experience taught him a great deal and is something that will prove useful knowledge if he were to get another go in the Premier League. "Molde started off the season quite slowly, but as the team started to gel and develop they ended up playing some exhilarating football. "In my view, despite ending up second behind Rosenborg, they were the outstanding team this season. "And had they not faced a slump in form during the summer months, in which they dropped some unnecessary league points - the early European rounds took their toll - they would have caught Rosenborg in the end. "Molde played with a lot of energy, pace and flair. Their home win against Rosenborg towards the end of the season was the best performance I've seen from a team in Norway this season. "Ironically, it was a bit like watching Liverpool against Manchester United at the weekend - Rosenborg could hardly get the ball out of their own half. "Solskjaer has also done exceptionally well by bringing through some new talented players this season. Erling Braut Haland has already been sold to Red Bull Salzburg for a huge transfer fee and Eirik Hestad ended up as one of the most exciting midfielders in the league." That emphasis on adventurous football and nurturing young players is precisely what United are looking for after Mourinho was deemed to have failed to deliver on both those fronts. So what kind of manager is Solskjaer? Solskjaer is a principled coach but one whose man-management may have to improve if he is to succeed at United, according to former Wales and West Ham defender Danny Gabbidon, who Solskjaer signed at Cardiff. "From being a player in the dressing room under Solskjaer's management, I couldn't really say anything bad about him as a person," Gabbidon told BBC Radio Wales. "But whether he could manage those big personalities and be the guy to lay down the law when it's needed, I'm not too sure." Gabbidon was one of 18 players signed by Solskjaer during his brief spell at Cardiff, and the majority of those were failures. Guido Burgstaller and Javi Guerra were among those who quickly faded from view, while Mats Moller Daehli, Magnus Wolff Eikrem and Jo Inge Berget were three players recruited from Norway who struggled to make any meaningful impact. At times, Solskjaer's scattergun approach in the transfer market gave the impression he was indulging in a real-life version of Football Manager, the computer game he said he had enjoyed playing before making the actual move to the dugout. Given that track record, if Solskjaer is to take the reins at United, it will be interesting to see how much influence chief executive Ed Woodward will allow the Norwegian when the transfer window reopens in January. Charming and engaging but where is the vision? After one of his many defeats in charge of Cardiff in 2014, Solskjaer walked into a cramped, makeshift interview room at Cardiff City Stadium and started doing keep-ups with a balloon. "It's good for your control," he said with a giggle, seemingly oblivious to his side's loss to Chelsea earlier that afternoon. It was an incongruous moment typical of his short-lived reign, Solskjaer's sunny demeanour undimmed neither by Cardiff's relegation from the Premier League nor the fact this was his 12th defeat from 18 league matches that season. Things did not improve, and a disappointing start to the following campaign in the Championship saw Solskjaer sacked in September, less than nine months after he was appointed. The Norwegian and Cardiff's chairman, Mehmet Dalman, both cited a "difference in philosophy" as the reason for his departure. It sounded like the kind of excuse an eccentric guitarist might offer after getting kicked out of a band. In truth, there was no real philosophy. That was one of the many problems of Solskjaer's Cardiff tenure: he was charming and engaging but he had no clear vision or discernible plan for his side. Now, having been back in Norway for a second successful stint with Molde, it seems Solskjaer will return to the Premier League as a more rounded manager than the one who floundered in south Wales. His exploits as a player have secured his hero status at Old Trafford but, as far as his managerial credentials are concerned, he is still something of a risk. And yet perhaps after the dreariness that defined much of Mourinho's reign, a risk is exactly what United need.